The dangerous Kiwi batsmen, Brendon McCullum was signed by the Kolkata Knight Riders in the very first IPL season in 2008. 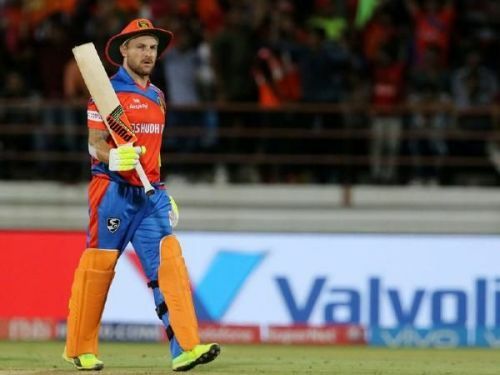 Later he left KKR and played for many other IPL teams namely Kochi Tuskers Kerala, Chennai Super Kings, Gujarat Lions and for Royal Challengers Bangalore last year. Also Read - IPL history: Kochi Tuskers Kerala squad - Where are they now? He showed everyone with his performances in IPL why he is recognized as a destructive player, especially in T20 format. He had scored 2,881 runs in IPL at a blistering strike rate of 131 and had a mind-boggling number of 130 sixes in his name. Though he bid goodbye to international cricket, he has remained consistent in all T-20 leagues of the world and still he is referred to as one of the most dangerous openers in cricket. Due to his below average performance in IPL last year, no franchise showed interest in this star player in the IPL Auction 2019. Still, he has a chance to play if he replaces any overseas player in the upcoming IPL season. In this article, we will list out the top 3 knocks which the Kiwi batsmen has played in his entire IPL career. Certainly, this was one of the most memorable knocks ever witnessed in IPL history. The innings became even more special as it was the opening match of the cash-rich league. The crowd enjoyed the fierce knock as Brendon McCullum stole the show with his destructive batting. Brendon McCullum played unbelievable shots, dominated every bowler of the host team RCB. With 10 fours and 13 towering sixes, he helped KKR beat RCB by 140 runs. Undoubtedly, it was one of the most explosive innings played by a player in IPL history and he also stands at the 2nd position in the list of the highest individual score in IPL, after Gayle’s 175*. IPL 2019: Match 23, CSK vs KKR, Match Prediction: Who will win today's match?